This ASCD Study Guide is designed to enhance your understanding and application of the information contained in Better Than Carrots or Sticks, an ASCD book written by Dominique Smith, Douglas Fisher, and Nancy Frey and published in August 2015. Most of the questions contained in this study guide are ones you can think about on your own, but you might consider pairing with a colleague or forming a study group with others who have read (or are reading) Better Than Carrots or Sticks. Discuss the quote on page 1 that is often attributed to Frederick Douglass. What has your school done to build strong children? Review figure 1.1 on page 3. Which of the restorative practices and beliefs are in place in your classroom, school, or district? Explore the reasons why the "rewards and punishments" approach is problematic. What are your experiences with this approach, and what might be improved? When are rewards appropriate? How can rewards be used in a restorative environment? Explore the reasons why the "shame and humiliation" approach is problematic. What are your experiences with this approach, and what might be improved? Explore the reasons why the "suspension and expulsion" approach is problematic. What are your experiences with this approach, and what might be improved? Review the list of elements that comprise an invitational education (p. 22) and discuss how each of these elements is mobilized in your classroom, school, or district. Discuss the four teaching types (Fig. 2.1, p. 23). Rather than focus on your current style or the styles of your colleagues, recall teachers from your past who fit into each of the categories. What do you remember most about each of them? Several approaches for developing relationships with students are presented beginning on page 24. Which of these work for you? How can you help others to develop stronger relationships with students? Use the Student Interest Survey (Fig. 2.2, p. 17) to get to know a student and then share the experience with others. What did you learn that will help you develop stronger relationships with students and thus improve classroom management? Review the aspects of quality instruction. Watch a teaching video, either from one of your colleagues or from a website, and analyze it for consistency with various aspects of quality. What trends do you notice? What are areas of strength? What are areas of need? How might purpose-driven instruction change classroom dynamics? If students know what they are expected to learn and why, might they engage more with learning tasks and behave a bit better? Review the five social and emotional competencies (pp. 42–43). Which of these are included in your classroom, school, or district efforts? What areas need developing? Self-regulation is an important characteristic to develop in students. What have you found to be an effective way to develop self-regulation? How do agreed-upon expectations contribute to self-regulation? Discuss the value of rules and procedures. What rules have you found useful in creating effective learning environments? What procedures ensure smooth operation of a classroom? Review the various procedures presented on pp. 56–57. Could any of them work for you? How might you adapt some of these for use in your own classroom? Educational Leadership asked students what they wanted in a teacher. The list, explained with examples, begins on page 61. Use this list as an inventory to assess the efforts at your school or district to engage students. Where are there areas for growth? Most problematic behavior is guided either by avoiding something or attempting to get something. Discuss examples of students' behavior with colleagues and try to determine if they were guided by either impulse. Analyze the problematic behavior of a specific student using the Survey of Observable Behavior (p. 73). Based on your analysis, what actions could you take to address the behavior? Use the sentence stems on p. 76 to guide your thinking. Use the continuum on p. 78 to identify your common approach(es) to addressing problematic behavior. Discuss specific situations with your colleagues in which each of the approaches was used to return the classroom to a learning environment. Review the list of ways to de-escalate a situation (p. 80). Some people turn this list into a poster or place the list near their teaching stations. How can you use these tools to calm students down when they are frustrated, angry, or upset? Review the various ways that peace is maintained (keeping, making, building). Which of these are strengths in your classroom, school, or district? Which need work? What is a "restorative mindset"? Do you and the people you work with have one? If not, what can you do to develop one? Practice affective statements with friends and colleagues in a low-stakes situation. Role-play as part of a professional development session the ways in which these statements can be used. Debrief how the statements made you feel. Schedule a class meeting using the agenda on p. 91. Let your students know the purpose in advance and invite them to contribute items to the agenda. After a few of these meetings, ask students if they value the experience and how the meetings can be improved. Discuss informal classroom circles with your colleagues. Try one out with students. Start with a low-stakes topic that is interesting to them, and decide whether it will be sequential or not. Discuss the guidelines for circles with students and invite them into the process. Talk with someone you trust about a time you were wronged. Use the question on p. 108 to discuss your experience. Ask yourself what justice would have looked like and whether you would have liked to repair the harm that was done. If you are brave enough, repeat the exercise above but this time focus on a time when you caused harm (intentionally or unintentionally) to someone else. Use the questions on p. 109 to discuss your experience. Ask yourself what justice would have looked like and whether you would have liked to repair the harm that was done. Consider the aspects of restorative plans (p. 113). Discuss the ways in which these aspects can be integrated into the interactions teachers, counselors, administrators, parents, and others have with students when serious situations arise. How can these aspects be systematized such that students begin to understand the harm they cause and how to repair that harm? Review the phases Mullet (2014) recommends (p. 115) to ensure that all voices are heard and that relationships are repaired. Practice these in role-playing situations, then discuss with colleagues the gaps in practice that need addressing. Use the questions on p. 117 (Fig. 5.1) to practice each of the phases. What is the difference between getting even and getting well? How might understanding this difference improve student behavior and create a healthy learning environment? Discuss the various formal classroom circles with colleagues. Identify individuals who can facilitate these circles and begin using them in low-stakes situations to develop them as habits. Invite students to raise topics worthy of discussion in formal circles. Review the restorative conference follow-up form (Fig. 5.2, p. 126). Discuss what might happen if this type of information were not provided to teachers and staff following high-stakes conferences. Commit to using the form (or another similar tool) to ensure that you establish and maintain communication routes. Review the section on re-entry plans (p. 129). What processes does your school use to ensure that students re-enter the learning environment in as productive a way as possible? Share with others. If the plans you have in place are not sufficient, begin drafting new procedures to ensure that re-entry is productive. How welcoming is your classroom, school, or district? What needs to happen for students, teachers, parents, and administrators to feel more welcome? What data do you use to make decisions in your classroom, school, or district? Do these data include student perspectives and areas related to discipline? What implications do the data have? Conduct a Discipline Audit (Fig. 6.1, p. 138). What actions will you take as a result of the audit? How can problems be prevented in the first place? How does having a preventative mindset contribute to a healthy, productive learning environment? Are you part of a productive team, or do you feel alone? Developing a team mindset can reduce stress and improve job satisfaction, not to mention provide support for challenging situations. Engage in some team-building activities with colleagues to facilitate strong relationships between and among the adults in the school. Reread the last sentence in the book. Consider what is within your power to change, and begin to do it. Ask yourself if students for whom you are responsible feel hopeful and cared for. Take action, even if there is only one student you feel you must reach. You could be the one person who makes the difference for that young person. 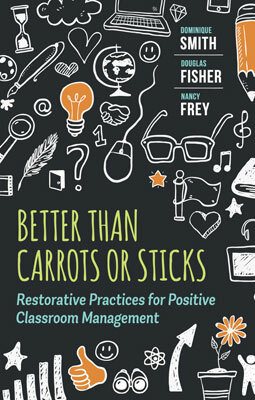 Better Than Carrots or Sticks: Restorative Practices for Positive Classroom Management was written by Dominique Smith, Douglas Fisher, and Nancy Frey. This 170-page, 6" x 9" book (Stock # 116005; ISBN-13: 978-1-4166-2062-4) is available from ASCD for $18.95 (ASCD member) or $24.95 (list). Copyright © 2015 by ASCD. To order a copy, call ASCD at 1-800-933-2723 (in Virginia 1-703-578-9600) and press 2 for the Service Center. Or buy the book from ASCD's Online Store.